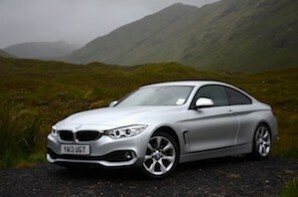 The 4 Series Coupe is the new name for the iconic 3 Series Coupe. This all takes a bit of getting used to, but putting the whole ‘what’s in a name?’ discussion to one side, is the 4 Series Coupe actually any good? As this is still really a 3 Series, everything that we liked before is still present and correct. That means a driver-focused set up, with rear-wheel drive, excellent material quality and some of the best drivetrains around which can deliver stellar performance on the official fuel economy tests but crucially can also deliver in the real world. Talking of performance, there is plenty on tap. With a hefty 295 lb.ft. of torque available between 1750 – 2500 rpm, the in-gear acceleration is even stronger than the 0-62mph time suggests. The fact that this can be combined with very good fuel consumption is key to the desirability of the 420d. In order to maximise the fuel consumption you need to specify the advanced 8-speed automatic gearbox which is particularly effective at reducing revs at speed, but the 6-speed manual gets very close and is significantly cheaper. The 4 Series Coupe combines strong performance with very good fuel consumption and BMW’s handling know-how. It is also an early adopter of Euro 6, so PM and NOx emissions are on a par with petrol engines making the 420d a genuinely low emission car. The real rival to the 4 Series is the 2 Series. So which one do you choose? If you want compact and agile, go for the 2 Series. If you want more grown-up but slightly less fun in the handling department, go for the 4 Series.